Two more days at the Casa?? By 7:15 am we were back at The Casa de Dom Inácio where Medium Joao (John of God) does his work. I wanted to sit in the Current Room again as The Entity prescribed this to me yesterday. I prayed that on this day I would be more comfortable and cooler. The mornings here are a bit cooler – by the afternoon it is over 90 degrees. I was able to go right to the front of the line of people going into the Current Room because of my mobility issues. Those over 60 years of age are allowed to do the same. People start lining up to get into the Current Room by 6:45 am. I was so grateful that today my pain went from the 8-9 it was yesterday down to a 2-3. Hooray! Whatever the Entity (Dr.Augusto) did to me yesterday afternoon has given me so much pain relief in my left hip. I was able to relax in this morning meditation and go into a deep trance, knowing the Entities were working on my well-being. I prayed for myself and everyone I could think of, as well as Medium Joao, that he may continue this work for many years to come and remain in good health. Amazingly, some years ago Joao had a stroke. He had some paralysis and was very much affected by it. While he was “in Entity”,his symptoms would disappear. After a while, the Entities decided that he should do surgery on himself, so he did! Of course it wasn’t “him” doing the surgery, but whoever the Entity was that day. After the surgery, Joao made a full recovery. At the end of the 3+ hour session in the Current Room, I enjoyed the Blessed Soup again along with the hundreds of other Pilgrims. After lunch at our Pousada and a short rest, we took a taxi back to the Casa where I had my first Crystal Bed sessions. Earlier in the day I had booked and paid for them ($10 U.S. for 20 minutes) at the Casa bookstore. My two sessions were not back-to-back but were one hour apart. During that hour I wrote out prayers for myself, friends, and family members and put them into one of the large Triangles on the campus. The Entities hear these prayers and do what they can for the people,whether it is mental, spiritual, physical or emotional healing. I am so grateful that I was able to do this! After a shower and meditation, my guide Deb Court invited me to join her and her daughter Cassie for dinner at the Pousada Luz Divina where the 5 other people in her group were staying. It was wonderful to get to know them better. There was a couple in their 70’s who had already been here a few times, a father (70’s) and daughter (50’s), and another woman in her 60’s, all but one from California. We enjoyed dinner and sat around for a coupleof hours swapping stories of our two days here, life history and views. The Luz Divina has a gorgeous garden with a labyrinth and views of the countryside and sunset. Wow! Back at our Pousada later in the evening I met awonderful woman M.D. from Chicago who was here with her 13 year old son (a triplet – the two girls stayed home with their dad.) I love meeting health care professionals who understand that we are more than mechanical machines to fix-- we are spiritual beings in a physical body. Incorporating spiritual healing into their holistic practices is where many practitioners are going. Being raised in India, this woman M.D. grew up learning this approach and has already put holistic principles into her Medical Practice. We were backat The Casa with our white clothing on by 7:15 am so we could get seats. By 9 am my “Second Time” Line was called. Deb had gotten a (free) ticket for me earlier in the Casa Store. Deb had told me that only in recent months the Entities have been asking if anyone in the Second Time line wants to volunteer for surgery, to go ahead rather than the former practice where the Entity had to prescribe it. So, I was fortunate that this occurred during my visit. YES! I wanted spiritual surgery. About 70 of us filed through the Current Room, past the Medium Joao in Entity (he was Dr. Augusto de Almeida, a Brazilian physician in a previous incarnation.) Dr.Augusto has said, “My phalange comprises not of ten, nor a hundred but thousands of Helping Spirits. I am the one who reaches to the very depths of the abyss to save a soul.” (A phalange is a compact group of people or souls.) Dr. Augusto is one of the main entities who heals through John of God. Volunteers and regulars at The Casa recognize him for his strong personality and his somewhat directive manner. He is known to be extremely kind and is deeply loved by all. We were all put in the Magnetic Pass room for about 30 minutes for our spiritual surgery. We were asked to keep our eyes closed and to put our hands over our hearts. It is always important when we are anywhere in The Casa to keep our arms, hands, feet and legs uncrossed so energy can flow through us unimpeded. I felt SO overwhelmed by the Unconditional Love that I was experiencing that my tears flowed freely. I was so grateful to be able to be there and experience this. I asked for healthy joints and limbs, flexible and strong. We were all given another prescription for the Passiflora Herbs as well. Once we were released from the spiritual surgery room, we were asked to go to either the English or Portuguese groups in the Garden area for our post-op instructions. We were told to take a taxi back to our rooms immediately and to sleep or stay quiet there with our eyes closed for 24 hours. We are to drink as much Blessed Water as we can while in Abadiania, too (and not just post-surgery.) I was drinking at least 3 Liters per day. Meals would be delivered to our rooms by our Guides or Pousada owners. We should only open our eyes for eating, showering or using the bathroom. I definitely felt like I was in a much altered state! I slept for two hours and listened to meditation music on my IPhone. When Deb brought my lunch to me she quipped, “This is every mother’s dream! To be told to go to your room for 24 hours, relax, do nothing, close your eyes, and your meals will be delivered to you.” Ha! I slept a lot and also listened to an Eckhart Tolle book on CD which I had brought with me from the library at home. His monotone voice was enough to put me right back to sleep, though. I did read a bit – a wonderful book that I bought here called “The Book of Miracles – The Healing Work of Joao de Deus” by Josie RavenWing. I met her at the Casa earlier in the day, too! In her book she says, "I believe the work at the Casa is having a huge ripple effect out into the world. The entities have frequently said to visiting medical doctors that spiritual energy healing is going to be the wave of the future in medicine, and that part of the mission of the entities is to transmit some of this energy to and through the doctors who come to the Casa." In my meditative state, I communicated with and felt the loving presence of my Higher Council – Archangel Michael, St. Germaine, Mary Magdalene, and Jesus. They were all congratulating me on following guidance and making it down here to receive this powerful healing – they said they were very proud of me. I also felt my mother, father and paternal grandmother with me through the veil from their home in Spirit. I stayed quiet in my room through 10 am the following morning. We now had 4 days to rest, integrate and explore our surroundings a bit until John of God returned the following Wednesday for more sessions at The Casa. Finally, the day had arrived when I was blessed to go before John of God (“Joao” in Entity. I was SO excited that I could hardly sleep. Everyone who goes before him is asked to wear white, so I got on my new white skirt and top – I felt as if I were going to my own wedding! I definitely knew that this was going to be a very memorable day. The lines of people were forming by 7 am to go into the Current Room. The Current Room is where people sit with their eyes closed and meditate for the entire time that Joao is in Entity, anywhere from 2 – 5 hours. You are asked to commit to the entire session, no matter how long it is and to only take a break to go to the restroom if it’s absolutely necessary, and then to return immediately. Joao does not stop a session until everyone who wants to come before him has been seen. People who meditate in the Current Room receive healing themselves from the multiple Entities who work with Joao. They also hold the energy for him to be able to maintain the Entity who he is embodying during that session. People may enter the Current Room between7:15 – 7:45 am (or until it is filled.) At 7:45 am they stop admitting people to the Current Room and they begin their meditation. A beautiful Irish woman (who runs a local restaurant) volunteers by leading the meditators there three days per week for both the morning and afternoon sessions. She prays aloud periodically to uplift and encourage the meditators. The night before, with my guide Deb’s help, I had formulated three requests for the Entity which they ask you to keep to 7 words or less. Deb and I took my requests to the Translator outside the Main Hall on this first morning to have them translated into Portuguese. Joao goes into Entity around 8 am (and 2 pm) on Wednesdays, Thursdays and Fridays. The Entity decides which lines of people he will see first. As a person in the“First Time” line, I waited until 9:30 am for our line to be called. Deb had gotten me a “ticket” (free) at the Casa Bookstore to be able to go in this line. I was able to go to the front of the line as they began because of my mobility issue. Armed with my three requests, I joined the dozens of others in white and we walked slowly and silently through the Current Room. I was overcome with emotion at seeing all of the beautiful souls there holding the space for Joao and receiving healing themselves. Tears began to run down my face as I entered the Medium’s Room. This room is also full of meditators, but one has to be invited by the Entity to sit in this room. There are about 100 people in eachof the two meditation rooms. At the front of the room sits Joao, surrounded by enormous crystals and a few peoplewith very special needs in large armchairs on both sides as we approached him. I went before Joao with my guide Deb there to translate for me. I was told that everyone gets exactly what they need and it does not matter how long we are in front of Joao, whether he makes eye contact with us or speaks to us – that is our ego’s need. The Entity sees and knows all – our soul and our needs are completely exposed. I was in front of Joao for about 10 seconds while he scribbled a prescription for the Passiflora Herbs on his notepad and handed it to us. He then told me to sit in the Current Room (meaning as often as possible while I am in Abadiania.) Next, a group of about 20 of us sat in the Magnetic Pass room (available in most Spiritist Centers in Brazil and worldwide) where psychic transfusions of energy come from the many Entities working at the Casa into each of us. After a prayer spoken by a volunteer for about 5 minutes, we were led out of the building into the blinding,hot sun – forever changed. I walked around the corner to the garden where I joined others in eating the Blessed Soup which is offered each day to the Pilgrims. It is a light vegetable soup made fresh weekly by staff and dozens of volunteers, then it is blessed by the Entities. At this point I was in such an altered state that all I could do was take a taxi back to my Pousada and lie on my bed listening to a Meditation CD until lunch. I wanted to stay in silence, so I sat alone at lunch and showed a message to others on my phone’s notepad telling them I was staying in silence. After lunch,I joined others in a taxi back to The Casa to prepare to sit in the Current Room for my first time. I had been warned to bring pillows for extra comfort, so I had my REI inflatable pillow to sit on and one for lumbar support. I was determined to reap the numerous benefits of healing that I had heard about and to follow the prescription of the Entity. At 1:15 pm we were allowed into the Current Room. I found a seat in the back row with plenty of leg room and inflated my pillows. The volunteer welcomed us and told us that if we chose to stay, it would be for the entire time that Joao was in Entity, from 2 – 5 hours, and that we were to keep our eyes closed the entire time. The energy is very high in the room and our energetic field is wide open while in the Current making us vulnerable to absorbing negative or harmful energies from people filing through the room towards Joao in Entity. By keeping our eyes closed, we contain our energy field and stay safe. It was over 90 degrees (32 C) outside and even hotter in the Current Room with all of the body heat and little fresh air. There were fans on us, but I was sweating profusely as I am unaccustomed to the heat (living in the naturally air-conditioned Pacific NW!) I estimate that it was about an hour before I began to get VERY uncomfortable. My right buttock was screaming and the pain was shooting down the back of my right leg – about a 7-8 on the pain scale (10 being the highest pain.) I kept fidgeting, trying to lean on the bench backs in front of me, lean on my cane, shift left, etc. but there were people on either side of me and I was concerned about disturbing them. The stoic New Englander in me made me stick it out as long as possible despite my misery. I drank my entire liter of water in my backpack and finally had to raise my hand to be allowed out of the room to use the bathroom. They stress how important it is to never leave the Current until the session is over, so I had every intention of returning. When I looked at the clock I saw that I had been there for 3 hours already! While out, I got some fresh air, more water, and walked around for a few minutes. When I went back in, I asked the volunteer by the door if he knew how much longer the session might last. He did not know. I told him that I was in a LOT of pain and would love to finish the session lying down if at all possible. He told me to check in the infirmary directly adjacent to the Current Room. I knocked on the door and a volunteer led me into the infirmary. I told them of my situation and the woman said that only the Entity could admit people to the infirmary. She told me to sit in her wheelchair and she whisked me away to pass in front of Joao in Entity once more! I was the final person in the afternoon session – just in time. Normally no one is allowed to go in front of the Entity more than once per day, but here I was again. She spoke Portuguese and informed the Entity of my condition. He gave me another prescription for Herbs and said he would work on me in the Magnetic Pass room! I was SO grateful and hoped that I might get relief from my pain. After about 5- 10 minutes in the Magnetic Pass room, I was rolled outside in the wheelchair to a taxi. What a day……. I took a cold shower then enjoyed sharing stories with other Pilgrims from the U.S.,France, and Australia around the dinner table. One of my companions told me that I seemed to be a bit spryer than the day before. As I walked back from getting something in my room, I noticed the pain in my left hip was GONE and I was hardly limping! I even held my cane up in the air and told everyone to watch me walking. They all cheered. As I write this 2.5 weeks later I am still pain-free. Before I left I could not even walk around my own house without using my cane and being in a lot of pain. Now I use the cane less (I use it only for longer distances as I feel more secure and can walk faster) and there is no pain in my left hip. Four days after I returned, I walked to the County Courthouse with our election ballots using my walking poles (about an hour round trip!) I still limp and walk slowly. I still cannot reach my left foot and am very stiff, but the healing continues. Miracles DO happen and I am grateful. I have been home now for 6 days from my two week trip to Abadiania, Brazil to visit the Medium/Healer John of God (“Joao” in Portuguese.) I still feel as if I am in an altered state, integrating the mind-bending and life-changing things I learned, witnessed and experienced. On October 21, 2012 at 4 am in Washington State I began my 32+ hour journey to Abadiania in a shuttle, three planes and a taxi. My third plane sat on the runway in Sao Paolo, Brazil for 2.5 hours after we boarded before we could take off becauseof a computer malfunction. So, when I arrived in Brasilia (the capitol of Brazil), my personal guide, Deb Court (a Minister from my seminary) and others in our group had already left. I was so grateful to see my dear taxi driver Bolivar waiting patiently for me with my name on a sign when I finally arrived. He drove me to Abadiania, about1.5 hours through the beautiful rolling hills and small towns. I was glad that I had requested a wheelchair at each airport on this very long trip. With my cane, heavy backpack, and painful hip, it was a necessity to navigate the long corridors, endless queues, and gate changes. It was a welcome site when I checked into the Pousada Jardim Dos Anjos (Garden of the Angels) and saw my nice, clean room with a double bed and private ¾ bathroom. Deb had even put some lunch aside for me! The owner served it to me in the lush, quiet garden –ahhhhh…. I had no idea what meal I was on as it was now Monday, October 22 at 4 pm in Brazil. I just know that the food was wonderful and that I was hungry. The owners here speak perfect English and the food was fabulous. I can highly recommend staying here if you go to Abadiania. Another plus is that it is toward the far end of the town away from The Casa de Dom Inacio so it is very quiet. The Casa holds two healing sessions per day, 8 am and 2 pm on Wednesdays,Thursdays and Fridays when Joao is in Abadiania. Sometimes he travels to other parts of Brazil or internationally, seeing up to 20,000 people for healings in 3 days (while “in Entity.”) Millions of people from all over the planet have come before this generous and dedicated soul and received healings for mental, spiritual, emotional and physical maladies. He has dedicated his life for over 50 years to helping people. What an honor it is for me to have been able to go there! On Tuesday afternoon at 3 pm (times change so check if you are going there), volunteers lead pilgrims in a Sing Along! They have photocopied, spiral bound songbooks that are handed around and shared. People sit at the marble tables and benches where the Blessed Soup is eaten and sing everything from Christian hymns to “This Little Light of Mine”, all inEnglish. English seems to be a common language for the many travelers from around the world, which is convenient for me as it is my native language. After the singing, we visited The Casa’s store where they sell jewelry, books, CD’s, DVD’s, the Blessed Water (bottled water), the Triangle (a symbolof Faith, Love and Charity used here), and loads of crystals and other huge stones from the local area, all of which are blessed by the Entities. There is no charge for any of the healing work done by John of God at The Casa. They do accept donations in a box in the Main Hall and support the healing work done there by selling the Herbal Supplements (more on this later), items in the bookstore, and 20 minute sessions in the Crystal Beds (or “baths” in Portuguese.) For years, Joao travelled around Brazil doing healings, but then God and the Entities guided him to settle in one place and start the healing center named after the Patron, Saint Ignatius of Loyola, the founder of the Jesuits. This town was the perfect place as it sits on an enormous crystal bed and has wonderful energy – considered by many to be a portal to other realms. When we returned to our Pousada for dinner we saw a flock of parrots in the tree in our garden and after dinner (every night, actually) we heard a loud, electronic sounding whistle. I was amazed to learn that the sound comes from an enormous bug (the size of a small bird, Deb told us)!! I am glad I didn’t come face to face with one. The frog and moth I saw were huge and a woman I met from the U.S. showed us a photo on her I-Phone of a tarantula that she encountered in her room at another pousada. Yikes! She did switch rooms…. This part of Brazil is lush and tropical with mangoes, avocados, pomegranates, and many other fruits growing around town. Lovely!! As I drifted off to sleep that night, it was with much excitement and anticipation for being in the presence of John of God in Entity and the many other Entities who work through The Casa the following day for my first time. I fully expected miracles as so many before me have experienced. I am going on a spiritual pilgrimage of healing to visit a man called John of God. He is a "reluctant mystic", rather like Edgar Cayce. About 40 years ago when Joao (John in Portugese) was an illiterate 16 year old farmer with only a 2nd grade education, he began to heal people. Spiritual entities began using him as a Medium to bring their healing powers into this dimension from the other side of the veil. Since that time he has been consulted by millions of people from all over the world. Over 70 entities (benevolent spirits) use him to perform seemingly miraculous healings, both physical and spiritual. He hosts one spirit at a time and afterwards remembers nothing that he said or did during the trance. His only intention is to be a vehicle for God's work and love. His mediumship is a part of the Kardec Spiritism movement in Brazil. They believe that we are all Spiritual Beings having a physical experience and that the Spirit lives on after physical death and may incarnate again and again to learn and grow spiritually. They also believe that every person can be a medium and communicate with Spirits who have crossed the veil and are no longer in physical form. Some people have an extraordinary gift for this, such as Joao. In their understanding, God's energy is so powerful that humans are better able to access it through intermediaries such as Joao, Jesus Christ, angels, highly evolved spirits and mediums. A good analogy is when a transformer steps down 220 volts for a 110 volt appliance. There are many Spiritist Centers around Brazil and even though the country is mainly Catholic, many people attend both their church and a Spiritist Center. Over the last few weeks I have had lunch or coffee with three local friends who have been to see John of God and I heard about their amazing experiences there. These three, and others I have communicated with who have gone, all say that it is a life changing experience. I have also read two books to prepare me: Spiritual Alliances: Discovering the Roots of Health at the Casa de Dom Inacio and Kardec's Spiritism: A Home for Healing and Spiritual Evolution by Emma Bragdon, PhD. Oprah Winfrey has featured him in one of her TV shows and in articles in her magazine. She, herself, went to see him in May 2012. See some videos here: http://myown.oprah.com/search/index.html?q=john+of+god&page=1&where=video_oprah ; There are also many articles on her site about Joao. I am surrendering to whatever healing God has in store for me - of body, mind, or spirit or some of all three. I am SO grateful for this opportunity and am going with an open heart. I know I will get exactly what I am supposed to receive. It was the first time I had ever had such a powerful experience of "knowing." In late 2003, I was reading an e-mail from James Twyman, the author, movie maker and "Peace Troubador". I had subscribed to his "list" after a friend kept forwarding his notices to me. When I read about the Seminary of Spiritual Peacemaking that he was founding to create Interfaith "Peace Ministers", I sat at my computer and cried. I now recognize this as one of my visceral reactions to a Truth, with a capital "T"! I also get "goose bumps" on a smaller scale, but the tears are how I now recognize an important message in my life. After reading about the Seminary, I KNEW that I had to participate. I certainly was not looking to add anything to my very busy life. I had a new marriage (5 months), a new career (in real estate, after being a homemaker and at-home mother for 20 years), and two sons, 19 and 9 years old. When I told my husband of my plans to enroll in this two year program to earn my Masters in Divinity, he was less than pleased and not very supportive. I knew in my heart that this was "my call" and that it was critical for me to pursue if I were to fulfill my life purpose. There was no decision - I would just have to find a way to fit it in, which I did. Sadly, my seminary program and ordination contributed to the ending of our marriage several years later. I knew I had to be true to myself and answer this call or I would always regret it. I am grateful that my ex-husband happily remarried 1.5 years after we separated. The program was a rich and deep offering of weekly online lessons, reading, conference calls, personal mentoring with one of the Seminary Coaches (the wonderful Laura Derocher was my coach), and retreats in Ashland, Oregon where our Seminary and Sanctuary are. I have met so many amazing people from all over the world and continue to find it very meaningful and inspiring. We now have over 600 Peace Ministers in 23+ countries with new Ministers being ordained several times per year. You can learn more at: http://www.emissaryoflight.com/ We no longer have a two year M.Div. program, only a 3+ month "Fast Track" program which ends in ordination. Those attributes are abundance, agape, courage, patience, wisdom, certainty, compassion, joy, clarity, understanding, depth and generosity. We wrote and discussed how we could each exemplify these and how they relate to Inner Peace. The second year of the Seminary was devoted to discovering how we might take our Ministry out into the world. We each were required to complete a Peace Project. Being a business woman, I was inspired to create a new kind of business networking group in my hometown of Bellingham, WA. Our group was based on principles of collaboration and abundance rather than competition and lack. I named it the "Prosperity Professionals Network" or PPN. We met every Friday morning from 7 - 8:30 for about three years! What a wonderful group it turned into. After our weekly meeting, many of us would go to breakfast together. People came from as far away as Langley, B.C.! We had between 10 and 20 people every week with one educational presentation by a person in the group (or a guest) and introductions where we each got to give a brief description of our business and what we were looking for as far as clients, help, resources, etc. We had no limit in any categories - all were welcome. I am still in touch with many of the people I met during this time. We really bonded and learned so much from one another! I was ordained at a retreat in Oregon in June, 2005 and earned my Masters in Divinity the following year when I finished all of the course requirements. I began doing weddings in 2006 and added Memorial Services in 2010. I enjoy helping people in times of life transitions. At retreats I met people who had well developed ways of "knowing" or gnosis. This is a term often associated with the early Christian Mystics who communicated directly with God (the I AM Presence, "All That Is", Spirit, or whatever name you choose to give it.) Some people would hear voices or sounds (clairaudience) and some would see visions (clairvoyance) and some would have feelings (clairsentient.) I was envious of these rather concrete methods of knowing and wondered if I'd ever be able to experience this. It wasn't until I read a fascinating book by Doreen Virtue, Ph.D. (author of 47 books), about the different ways of "knowing" that I learned about my own way - claircognizant. Claircognizance (clear knowing) is a metaphysical sense in which you know something to be correct but may be unable to back up your statement with fact or how you came into that information. At first I didn't trust my own "knowing", but over time I have learned to trust. One tool I have used as a visual cue is the pendulum. You can learn more about how to use one in the book: Pendulum Magic for Beginners: Power to Achieve All Goals by Richard Webster. Now that I have achieved more confidence in my "knowing" I use the pendulum less often, but still consult it for clarity at times. My first "mystical" experience was in 2007 on a trip through France with my husband and about 35 others from my Seminary to Sacred Sites connected with St. Mary Magdalene. We were a 45 minute walk up a hillside in S. France in the cave at St. Baume where Mary Magdalene had lived for the last 33 years of her life (now a chapel run by several Benedictine Monks). 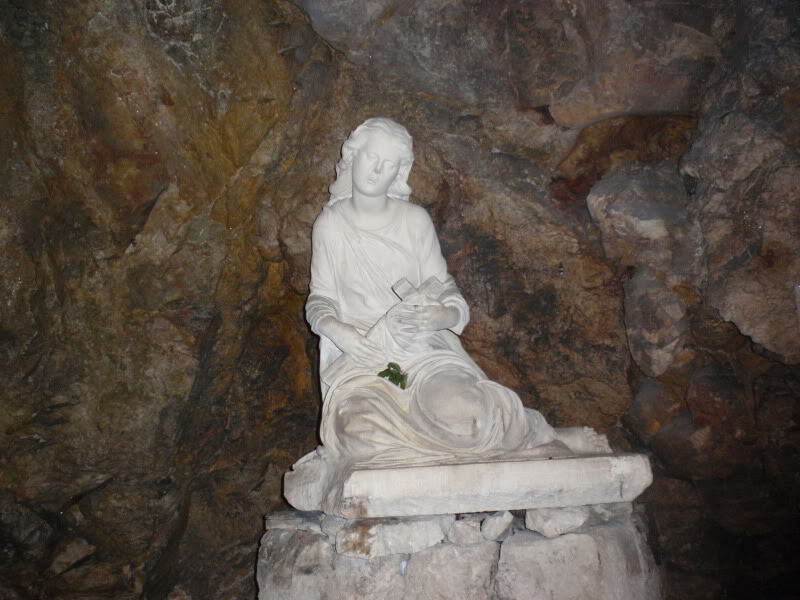 I was sitting in the lower part of the cave in front of a gorgeous white, marble statue of her with candles lit all around her. (Photo: http://www.whale.to/b/GrottoofMaryMagdelena443.jpg) Suddenly I realized that she and Jeshua were with me...and I began to cry. I felt their powerful love and presence engulfing me. They instructed me to jump off of a cliff (in my mind's eye where I was with them...), and I refused. They asked me if I trusted them and I assured them that I did, after all, they were my Spirit Guides, along with Archangel Michael and St. Germain. Again, they instructed me to jump off of the cliff. Again, I said no! After feeling their love and understanding where they were going with this, I finally acquiesced thinking, "if I can't trust Mary Magdalene and Jeshua, who can I trust?" As I leaped off of the cliff in my inner vision, my fear disappeared and my WINGS UNFURLED!! I was blown away. By this time I was sobbing......and feeling so full of love and trust in God and my Guides. I am SO grateful!! So, I have learned to trust my "knowing" and my Spirit Guides implicitly. It is not always easy or popular. Sometimes it means losing friendships or having to withstand judgement. My heart knows that it is always for the Highest Good, and so I surrender to this Universal Wisdom. I am grateful for this journey and I thank you for walking it with me. Yesterday was a big day. I had been putting this off for months, but I finally went to see my Orthopedic Doctor to get a handicapped permit for my car. He understood as he has had both of his hips replaced and he is a few years younger than I! Canoeing, kayaking, sailing, bicycling, dancing, yoga. I am SO grateful that I am able to ride my bike with very little pain, and I ride daily while the weather is still so beautiful. I have found an adaptive, gentle yoga class to participate in on Friday mornings with teacher Ruby, a very sweet woman. I am looking into taking water aerobics. I LOVE my body for carrying me this far - for all of the amazing places it has taken me, for my two sons that it has helped me raise, for the joys it has been with me to experience while all of the parts were working amazingly well together! I AM a miracle. I believe we are all spiritual beings having a physical experience and mine has been so wonderful. Thank you God!! I believe everything in my life happens for a reason and it is my opportunity to learn from every challenge and grow in LOVE and compassion. September 30, 2012 -- Meredith's Blog: First Entry! Several people lately have suggested that I start a Blog. So, here I go…along with a million other bloggers. To quote a phrase I learned in my 8 years in Al-Anon, a 12-Step Recovery Program for families and friends of Alcoholics, “Take what you like and leave the rest.” It is doubtful that everything I talk about here will resonate with you, but I do hope that some of my thoughts contribute to your growth, to the raising of consciousness and to more Peace in theworld. Thanks for reading! Over the last year, I have done a LOT of traveling. All have been Spiritual Pilgrimages of sorts. In this initial entry I will recount the first trip in September 2011 when I spent 5 weeks in Europe. The first week I spent in Southern Spain with one of my fellow Peace Ministers from Finland, Raija. We stayed in Nerja, Spain on the Costa delSol where my mother and her husband had a home for 25 years and spent every winter (thus escaping the snow in New Hampshire where they had lived since the 1960’s.) I went to Nerja to scatter my mom’s ashes on the hill behind their home where they loved to hike every morning (and did so until they were in their late 70’s.) Mom died on Sept. 19, 2010 at the age of 88 from Alzheimer’s. Her husband predeceased her by a few yearswhen he was 80. I spent many happy times with them at their home in Nerja -- it was bittersweet to return after so many years. I am grateful that I did, though,and that Raija was able to join me -- for the emotional support she gave me and for the fun we have being together. We enjoyed time on the mile-long Burriana Beach in Nerja, wandering through the twisting, narrow streets of the Moorish hill town of Frigiliana, eating dinner after 10 pm in the outdoor cafés, and a day trip to the beautiful and historic Alhambra in Granada. Raija and I had previously traveled together in S. France in 2007 visiting many sacred sites connected with St. Mary Magdalene. We are great traveling companions and close friends! From Southern Spain I traveled to Southern Italy for a week with another fellow minister from my seminary, Karen, from Ashland, Oregon. It was great fun to return to my old haunts in and around Naples, Capri, Positano, the Amalfi Drive, and Ravello. I had lived there for 6 months in the early ‘80’s and had traveled there on numerous other occasions with my then husband, Herb,the father of my son Christopher. During Herb’s 36 year career as a U.S. Naval Officer, he had two tours of duty in Naples with NATO and his sister married a Neapolitan, so we had many friends and family there to visit and socialize with. I absolutely adored all of our time there and am so grateful I was able to return and share it with Karen. It was an added blessing to get better acquainted with Karen as well. Next, Karen and I met up with James Twyman (the author, movie maker, and Peace Troubadour who founded my Interfaith Seminary of Spiritual Peacemaking) and 37 other people from all over the world to walk for Peace across Umbria and Tuscany for 10 days. We began by spending the first 3 nights in La Verna, Italy at a monastery where St. Francis of Assisi used to go on retreat and where he got his stigmata. It is a very magical, holy and beautiful place which is still used as a monastery these 800+ years later. The hike was an extremely challenging one over the next 10 days through the gorgeous hills, forests and fields of the region on trails and dirt roads. The first day one of our Peace Walkers fell and broke her arm and on Day 3 a fellow pilgrim fell and broke her leg! After those mishaps, we made it to Assisi with no further injuries other than some blisters and sore muscles. Sometimes we had to stay in 2 - 3 small hotels as the towns were not large enough to have one hotel that could accommodate all of us. It was quite an adventure! Forty was a better number than the 67 walkers we had on the first Peace Walk that I took with James Twyman in 2005 from Assisi to Rome over 10 days – that was like herding cats! It was way too large of a group for this sort of pilgrimage. Some days were longer than others, but most days involved 4 - 6 hours of strenuous walking. Since having a full knee replacement in 2008, I was only able to walk for 2-3 hours per day before I needed to stop. Our two Italian women guides, Patrizia and Marisa, were very accommodating about having someone pick me up using their car and taking me to the hotel in the next town for a rest.